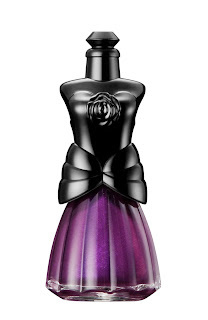 I’ve mentioned before, here and on Now Smell This, that I’m a devoted admirer of Anna Sui’s fashion and her overall style, including her fragrance and cosmetics lines. 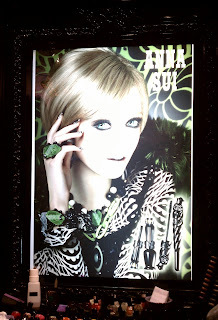 I attended a party at the flagship Anna Sui boutique during Fashion Week last month, and I promised Annie a post about it; my non-blogging life has been busier than usual this fall, so I’m a little late, but I’m finally ready to share what I saw and learned. 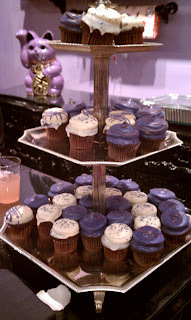 This party was planned to preview the Anna Sui cosmetics collection for Fall 2011, which definitely emphasizes the eyes. 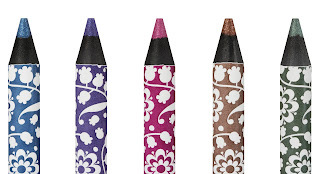 The collection includes four new color cosmetics products: Colored Lash Amplifying Mascara in three shades (black, hot pink, and bright blue, for $28), an Eyebrow Color Compact palette in a range of three browns ($28), Perfect Mascara in black ($28), and vivid and sparkly Eyeliner Pencils in five shades ($19). There are also three limited edition decorative compacts for powder foundations ($15). All the packaging is typical rock-and-romance Anna Sui style, of course; I particularly like the bow-shaped compacts for the brow powder. 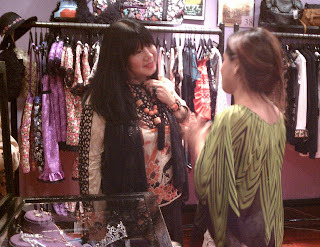 I ended up buying myself yet another Anna Sui dress that night, after browsing the cosmetics and eating cupcakes and saying hello to the ever-gracious Ms. Sui herself (that’s her with one of her fantastic boutique staff in the picture). 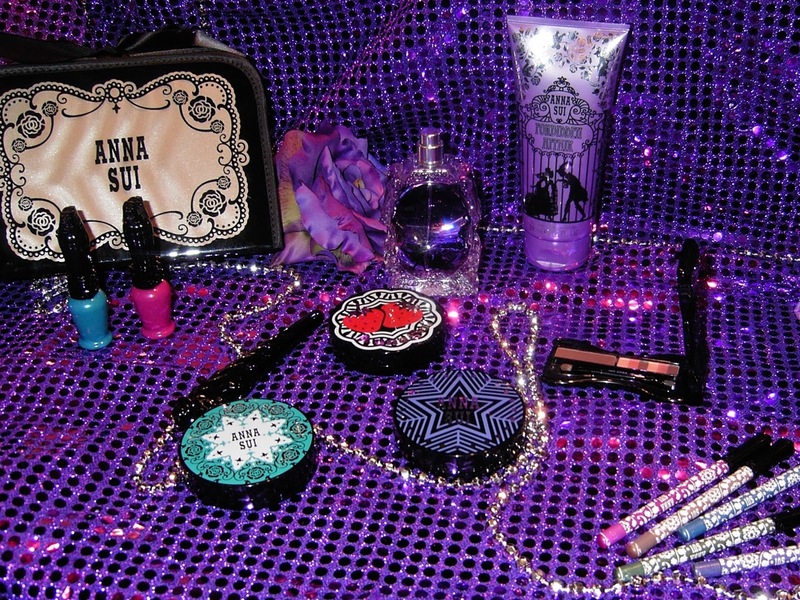 I’m planning a return visit to the boutique to pick up some of the cosmetics soon. I’d like to own one or two of the eyeliners, possibly the Neon Green (really more olive than neon) and Pearl Bronze shades, as well as one of the “Elegant” green-and-white powder compact. I’ll also be keeping an eye out for the repackaged nail polish line. 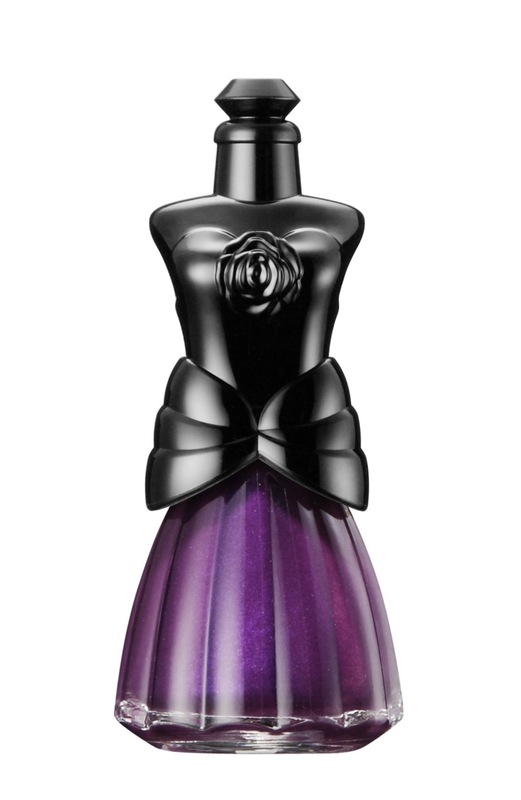 Its bottles are shaped like dressmaking forms wearing party dresses. So clever! 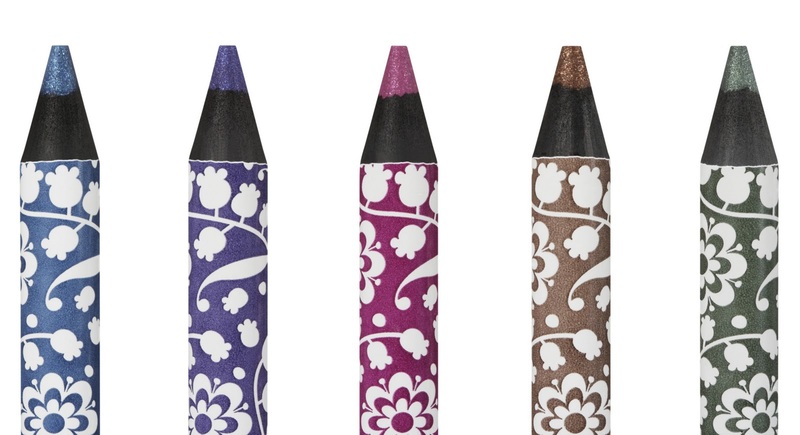 The new shades will range from shimmery nudes to rich purple and glittery green, so there’s something for everyone. Anna Sui’s cosmetics line is available at the Anna Sui boutique in New York (113 Greene Street, New York, NY 10013, phone 212-941-8406). Title lyrics from Depeche Mode. The compacts look so cool. Anyway...I am currently looking for a rococo black bed. I really wish she(Sui) would do furniture. I love the new nail polish bottles! Rock On: You have made me very happy!!! She really has the coolest taste in everything. Annie, She always says that she finds her furniture at antique fairs, flea markets, etc. and paints it black! Melanie, you need to try some of the polishes when they're released, and review them for us. Jessica, those eyeliner pencils look amazing! I want one or two or three! I adore Anna Sui and all of her beautiful packaging! She puts so much thought on every design. You're so lucky to have met her! rightly said she always have a nice collection aawesome post dude! she also got great looks of her things. I love you blog!Take care!